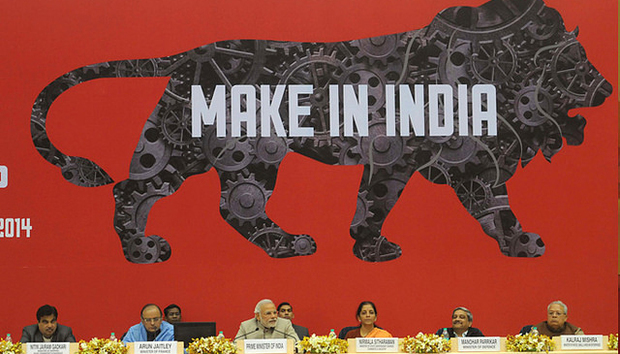 'Make in India' - slogan or substance? With Prime Minister Narendra Modi’s arrival on the scene, it looks like a season of slogans. ‘Swachh Bharat’ [‘Clean India Mission’], ‘Jan-Dhan Yojana’ [‘People Money Scheme’], ‘Mera Kya, Mujhe Kya’ [‘What Is In It For Me?’] are just some schemes and slogans, which are reminiscent of former Prime Minister Indira Gandhi, when he cried out from the same ramparts of Red Fort to get rid of poverty in India. And while ‘Garibi hatao’ [‘Abolish Poverty Rescue the Country’] may have captured the heart of millions of Indians in 1971, ironically instead of eradicating poverty we only managed to create a huge divide between the rich and poor. In the light of our previous experience with politicians making Himalayan promises, we have to seriously question ‘Make in India’ – the program which sets out to transform India into a global manufacturing hub. Yet at the same time we must remember that the winds have changed direction and India is no longer the economic weakling it used to be. India created waves at the World Economic Forum summit in Davos, showcasing participation of various sectors in this program. In fact, the logo of the Indian lion, stared down at the visitors from the lounge in Davos, symbolically giving a roaring welcome to investors from around the world. And Indian foreign minister, Arun Jaitley led an impressive delegation of ministers from other departments, government officials and industry representatives. Meanwhile, in a separate show in Washington DC, Amitabh Kant, Secretary, Department of Industrial Policy And Promotion, told a gathering of more than 200 influential people, “A major highlight of the 'Make in India' initiative is to use technology to leapfrog in terms of industrial growth." Communications and Information Technology Minister Ravi Shankar Prasad, in a video message to the "Digital India Roundtable" in Washington, declared with aplomb that India would become a powerful digitally connected world. "There is enormous scope for investment, growth and also very exciting business prospects. India today is a happening place," he said. The Commerce and Industry Ministry has planned a media blitz for 'Make in India' campaign at Hannover Fair in Germany in April. Obviously, the Indian government is out on a mission to promote ‘Make in India’. There is no dearth of announcements regarding ‘Made in India’. A slew of ordinances and laws to simplify corporate tax structure, land acquisition, foreign direct investment etc. are on the anvil. But the image of India as a license raj is not easy to brush aside. You have to deal with national, state and local bodies to get your business off the ground. According to a World Bank report, it takes 28 working days to start a business in India. In comparison, it takes six days to get off the block in the United States and United Kingdom. For ‘Make in India’ to take off, there is an urgent need for reforms in government functioning and amendments in laws governing business operations in India. It seems as if the world is waiting to invest in India. The ‘Make in India’ program has attracted many countries. At the event hosted by Japan External Trade Organization, Modi rhapsodized on the ‘Made in India’ theme claiming that the era of “red tape” in India has been replaced by a “red carpet”. On its part, Japan reiterated its resolve to finance projects worth billions in India. In fact, a slowdown in the Chinese economy may well make Japanese companies scurry to India when they want to set up a manufacturing base. Kia motors, the second largest automobile manufacturer of South Korea wants to set up a manufacturing base in India, in anticipation of a slowdown in Russian and Chinese markets. Moscow has plans for a manufacturing facility in India as well to export light utility helicopters every year. The United States has responded cautiously to the call for ‘Make in India’. US Secretary of State John Kerry voiced concern over the push for the use of indigenous capabilities. The focus for US has always been to sell in India rather than manufacture here because of their own compulsions, both domestic and international. The United kingdom on its part has launched ‘GREAT Collaboration’ with a fanfare. The first great collaboration is the partnership between UK’s BP plc and India’s Reliance Industries Limited (RIL). India is a resurgent nation. While other countries like China, Japan and Russia are staring at an economic slowdown, Indian business sentiment is on the rise. According to the World Bank India surpassed Japan in Purchase Power Parity (PPP) in 2014. The International Monetary Fund (IMF) has predicted that Indian GDP in 2016 will be 6.5%, the highest in the world and above China’s GDP of 6.3%. India’s GDP by 2020 is expected to be $9.6 trillion which will make it the third largest economy in the world behind China and the US. All these figures point to a buoyant economy in the near future. ‘Make in India’ program should therefore find the circumstances quite conducive and ripe for implementation. Another reason cited by experts in favor of India is the slowdown in the Chinese economy. The manufacturing activity in China will witness deceleration due to rising local wages and lower domestic consumption. Under such circumstances, foreign companies will start looking for greener pastures like India. The new Indian government is pushing for reforms in Indian laws to attract foreign investment. ‘Make in India’ will get a fillip through these initiatives. Will it remain a slogan? We have seen many clarion calls for reforms in society and in our governance. Each new government in India declares a novel scheme to lift the citizens out of poverty. Indians are a sentimental lot and are easily carried away by flowery statements and promises by politicians. Unfortunately, we also have a short memory. Slogans of today may well fall into a bottomless pit and be forgotten in a few months from now. The key therefore will be implementation. The first issue which needs to be addressed is rampant corruption in the corridors of power. Government reforms must be accelerated and business sentiments have to improve. ‘Make in India’ faces challenges more from within the government machinery. The political will to contain the negative forces must be strong if ‘Make in India’ is to make it. Only time will tell whether ‘Make in India’ will remain a slogan. « Mexico: Business loans verified via Facebook? Sankarambadi Srinivasan, ‘Srini’, is a maverick writer, technopreneur and a geek. He writes on transformational social processes and technology trends which influence our daily lives.